The City Council meets the second Monday of each month at 7 pm at City Hall located at 615 Sunnyside St. Citizens are welcome to attend. Current agendas are available at City Hall. Monday through Friday from 7:30 am to 3:30 pm. 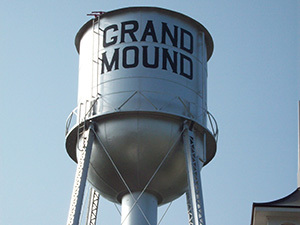 The City of Grand Mound provides water, sewer, garbage and recycling. Utility bills are due by the 20th of each month and if payment in full is not received by the last day of the month they will be disconnected. Payments methods accepted include check, money order and/or cash. 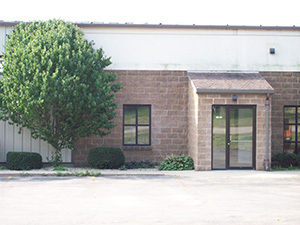 Payments can be mailed to PO Box 206, Grand Mound, or placed in the drop box on the left hand side of the front door at City Hall, or made in person at City Hall. Garbage is picked up every Tuesday beginning at 7 am. Garbage is picked up curbside. No Bulk Garbage Pickup. All items must fit inside of City provided trash bins. Limit of 3 trash cans per residence. 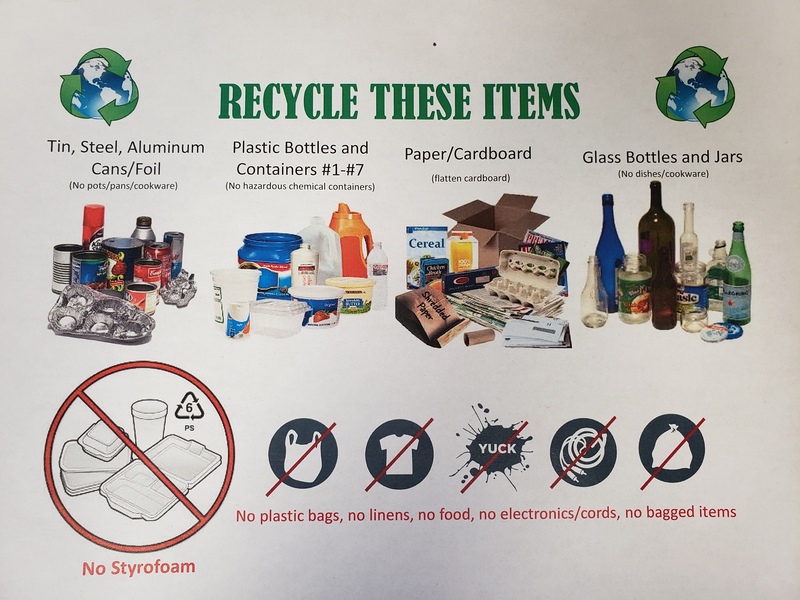 Recycling is every Wednesday beginning at 7 am. Recycling is picked up curbside in the black recycling carts. All recycling must fit inside of the cart with the lid closed. No other bins will be emptied. The City must pass along charges for appliance disposal. 2 yard dumpsters are available to rent for a fee of $15.00 per week (Tuesday through Wednesday). You may have a dumpster up to two weeks at a time. Please call City Hall at (563) 847-2190 to request a dumpster. 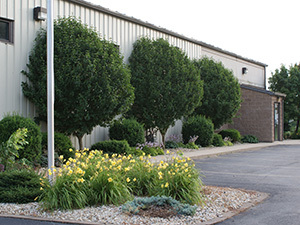 Yard Waste is picked up Monday and Thursday beginning at 7:30 am from May 1st through November 30th weather permitting. Citizen's may take their compost to the City Compost pile located South/West of the Sewer Lagoons on 250th Street in Grand Mound. The Compost site is open year round. Compost may be placed in Yard Waste Disposable Kraft Paper Bags, sealed, with a max weight of 50 lbs or may be placed in 20-30 gallon containers with a lid and handles that are waterproof and leak resistant, with a max weight of 50 lbs. Branches may be placed out for pick up that are no longer than 5 feet and a diameter of 6'' or less. Multiple branches shall be bundled and tied with twine or rope in a total diameter of 18'' or less. In the event of a weather related cancellation, a message will be placed on Channel 20 and the City Facebook Page. Non-operable vehicles are not allowed to be stored on your property. Any vehicle shall not be parked on a public street in one spot for more than 48 hours. Snow removal on sidewalks must take place within a reasonable time after a snowfall or the City will clear the snow, without notice to you, and bill accordingly. Residents are to keep lawns mowed regularly and in a neat condition with grass no more than 6” in length. If not done so, notice will be given by the City to mow the grass or the City will mow the property and bill the resident accordingly. 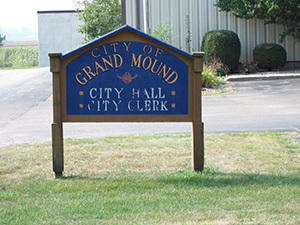 Accumulation of refuse is considered a nuisance in Grand Mound. Therefore, do not accumulate junk/refuse on process, around you house, or on your property. The City of Grand Mound has an ordiance regarding use of golf carts within city limits. A copy of the Ordinance is available HERE and you must obtain a Golf Cart Permit. A Golf Cart Permit is available at City Hall with a permit fee of $20.00 per year. Permits expire on December 31st of each year. You must bring your Golf Cart to City Hall to be inspected, and a flag and slow moving vehicle sign are required, along with proof of Insurance and a valid driver's license. STREETS: A link to the City's 5 year Pavement Management Plan completed by ISG Engineering, is available by clicking HERE. This plan document gives detailed information on the conditions of each street and the proposed/planned maintenance schedule for each street over the next 5-6 years. Periodic Exam (By the State Auditor's Office) Please click here to view the latest Periodic Exam.